The mud in the lanes only added to the positive vibe at the Highlands Droughtmaster Sale at Clermont with 68 from 74 bulls selling for a gross of $590,500 to average $8683. The $38,000 top price was reached twice. Heifers sold to an average of $3125 to top $5000 with a 100 per cent clearance. Redskin Harley (S)D5 by Dalmally Yale (H) D3 sold for $38,000 to Warren and Carolyn Kenny and family, Wajatryn Droughtmasters, Gayndah. Soon after in the Donaldson family draft of bulls Medway Wanditta (P) D5, from the Medway Terrica (D) D5 sire equalled the $38,000 top price being purchased by Tom Flohr, Red River Droughtmasters, Moranbah. The sale event also included a meet and greet the night before, incorporating a charity auction in aid of the Little Windmill charity, which supports injured and sick children in rural and regional Australia. 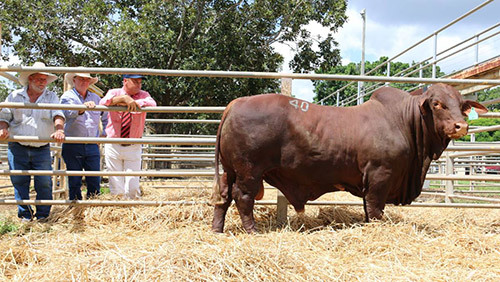 Vendors also donated a portion of allocated bull sales to the charity and in total $15,860 was raised for the worthy cause plus gold coin donations. Vendors in the sale were Strathfield, Huntly, Kenlogan, Toronellah, Redskin, Medway, Oasis, Almafi and Karragarra. 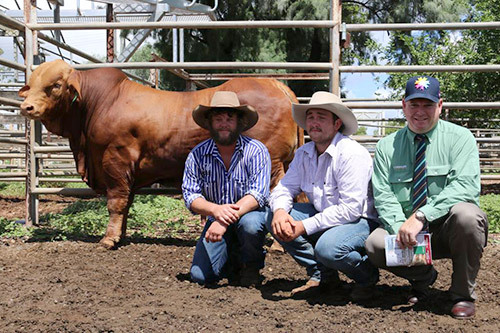 Medway Wanditta (P) D5 the equal top price $38,000 bull at the Highlands Droughtmaster Sale, Clermont, pictured with representing the Donaldson Family, Medway Droughtmasters is Brenten Donaldson,Tom Flohr, Red River Droughtmasters and Mark Scholes, Landmark. Redskin Harley (S)D4 $38,000 equal top price bull at the Highlands Droughtmaster Sale, Clermont, pictured with vendor Ken Rutherford, Redskin Droughtmasters, Morinish, Warren Kenny, Wajatryn Droughtmasters, Gayndah & Randall Spann, Elders.